Advertising for your real estate business can be really simple using the dynamic remarketing tools offered by Google AdWords. The Real Estate Feed Template allows you to enter the relevant information you’d want included in your ads into a simple spreadsheet. You can then upload this organized document into your AdWords campaign instantly. Now you can save time and money by using this document to target your ideal customers. For your campaign, you want to start by creating a system of Listing IDs for all your offered properties. This will need to be unique, as they pertain to a specific piece of property. To grab your customers with your real estate feed ad, you’ll want to give a Listing name in column B. You can use this section to highlight key features of your listed property. You’ll also need to enter the location of your landing page when your customer clicks on the link. Enter this URL in the Final URL column. If you want to include an image of your property listings, simply enter the corresponding URL in the Image URL column. AdWords will support JPG, JPEG, GIF, or PNG for your real estate feed ad image. Another way to enhance the recommendation engine for customers is by adding the name of the city in the City column. This will help Google find people searching for homes in a specific area and target them for your real estate feed ad. You can also include a short description that hits the major selling points of your property and have them displayed in your ad. Simply enter these descriptions in the Description column, using the same format as the example provided. Another important thing you can include is the price of the property. You can either list the monthly mortgage rate or the entire cost of the home. Use the proper format currency code, ISO 4217 when entering your price. When organizing your properties into this system, it’s often helpful to use Property types (home, apartment, condo, etc.). 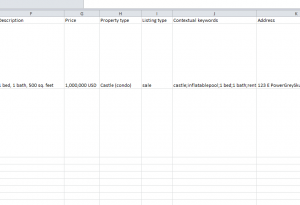 Enter the property type in column H.
The Listing type is where you can stress the point that your property is on sale. This can also be used to target more ideal customers, depending on their location, budget, etc. Next, be sure to include contextual keywords in column J. these keywords will help AdWords choose the right information to include when targeting a potential client as well. Most often, people will search for new homes by area. Make sure to enter the address of your property in the Address column and use the same format seen in the example document. Finally, if you’re looking for ways to track the details of the people that click your real estate feed ad, you can do this in a few different ways. The most common method is to enter a Tracking template that includes a set list of parameters to send your customer through, before hitting the landing page of your website. This will allow you to track valuable information about them. Similarly, you can create your own custom parameters by entering them into the Custom parameter column. This usually applies if your business has more unique elements that often are not considered in other businesses. Once you have your document ready, simply upload your completed temple into your AdWords campaign to apply this information for more dynamic results.